How Valuable Is Your Practice’s Google+ Local Listing? While I had the numbers on hand for how many Google users click on the organic search results vs. the paid ads, I was unsure of how these numbers were impacted by the Google+ Local listings that Google often includes in their search results. So, I had to do a little digging. During the training, I presented an image of Google’s typical search results for a local search phrase that looked similar to the following. 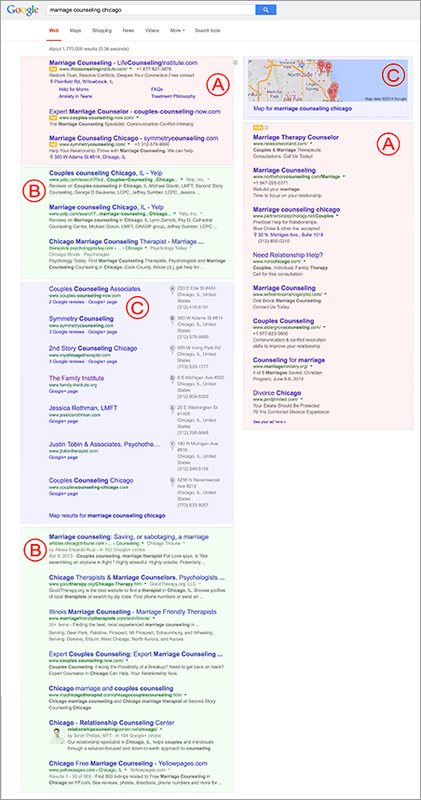 In this case, the search phrase used is “marriage counseling chicago” but the results will look similar for many phrases in which a local or city name is part of the search phrase. Google AdWords Ads – The areas with a pinkish-red background and labeled with an “A” are all Google AdWords advertisements and are labeled as such by Google’s use of the text “Ad” or “Ads” in orange. Organic Search Results – The areas with a green background and labeled with a “B” are what are known as the “organic” search results. These are the Web pages Google’s search engine thinks are the best matches given the search phrase entered and are un-paid listings, unlike AdWords ads. Google+ Local/Map Listings – The areas with the blue background and labeled with a “C” are Google+ Local listings (formerly known as Google Places and/or Google Maps listings). The point of this breakdown was to quickly show the three major sections of the search results, as well as show some of the options therapists have available for getting first-page search engine rankings. I also discussed how anywhere from 60 to 90 percent of search engine users only click the organic search results (section “B” in the image above), as opposed to the paid ads (section “A”), which typically receive only 20 to 30 percent of the clicks, if not less. You see, while this tripartite division of the search results is pertinent when it comes to understanding the options available for achieving first-page search engine rankings, it creates a false dichotomy when it comes to search engine user behavior. As shown in the image above, Google often inserts local business’ Google+ Local listings into the middle (and even near the top) of its organic search results. And, when it comes to the organic results, with few exceptions, position is what matters most. 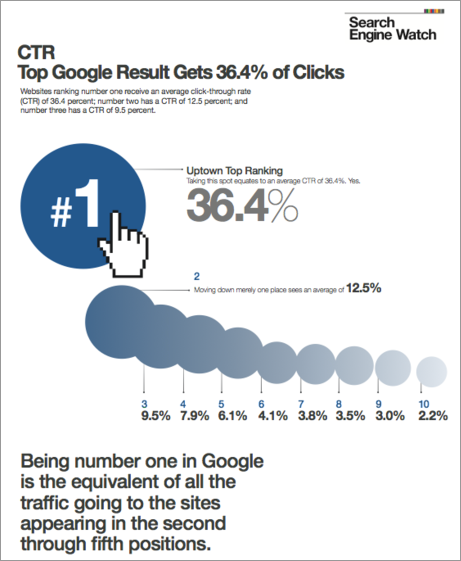 While click-through rates (the number of people who click any specific link) can vary from search phrase to search phrase, as the graphic above illustrates the top organic listing in the search results typically receives between 30 and 40 percent of the clicks. And this is by and large true regardless of whether that link is an “organic” listing or a Google+ Local listing. In fact, when it comes to click-through rates (CTRs), the organic search results and Google+ Local listings are largely synonymous (at least at present). In the graphic above, you’ll notice that that I’ve removed the “C” category for the Google+ Local listings and have merged them with the “B” category for the organic search results. This is because, from a click-through point of view, the Google+ Local listings ARE organic results. If you like this post… you’ll love TMI Membership… check it out below. Get all of the checklists, blueprints, tutorials, and step-by-step action plans you need to start getting more new clients in the next 30 days! 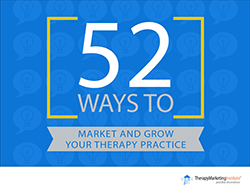 Click Here to Join the Therapy Marketing Institute Today! The good news in all of this is that, while it’s unlikely a Google+ Local profile for your practice will achieve a first- or second-place listing, you can achieve a third-, fourth-, or fifth-place ranking with a Google+ Local profile. 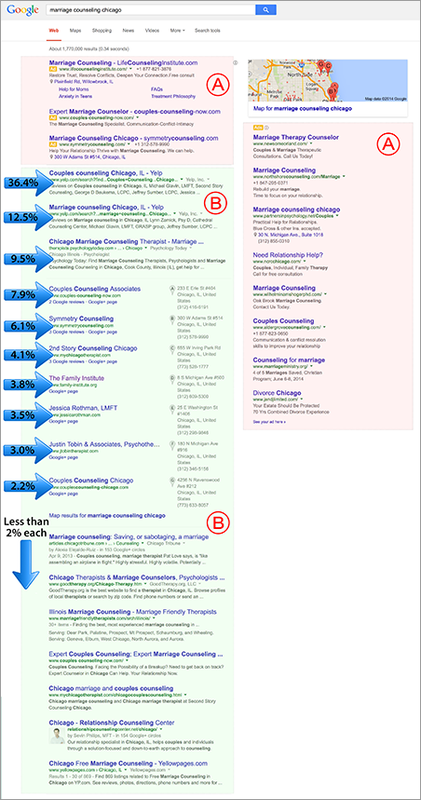 And, in the case of the highly competitive “marriage counseling chicago” search phrase used in our example, it’s often much more difficult to rank your individual website higher in the search results than your practice’s Google+ Local profile. So, back to our original question… How much is a Google+ Local listing worth to your practice? As I said, these numbers are all aggregates and they will vary from day to day, city to city, and search phrase to search phrase. However, using our “marriage counseling chicago” search phrase as an example, this phrase is searched an average of 480 times each month. If we assume a conservative 65 percent of users click the organic search results (as opposed to clicking on the paid ads or simply leaving the page or trying another search phrase), this means 312 searchers each month click the organic search results for this phrase. The first Google+ Local listing comes in fourth in the organic search results in the example above. Using the 7.9 percent CTR figure for this position, we could reasonably expect to get 24 click-throughs to our website each month if our Google+ Local profile achieved this ranking. Now, for the sake of this example, let’s assume only 5 percent become a client. That’s 1.2 new clients per month from our Google+ Local profile. 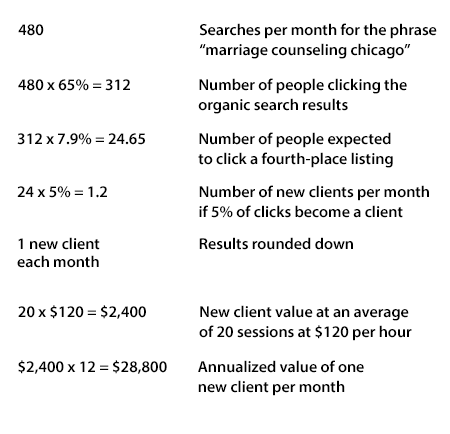 How much is a new client (on average) worth to your practice’s bottom line? If you get only one new client each month, charge an average of $120 per hour and see a typical client for 20 sessions, that’s $2,400 per month in new business from your Google+ Local profile or $28,800 per year! What if you can’t achieve the top spot and the fourth position in the organic search results overall for your Google+ Local profile? Let’s say your Google+ Local profile comes in sixth or seventh place in the overall rankings in the organic search results. If your Google+ Local profile receives an average of only 4 percent of the click-throughs from the 312 average monthly clicks in the organic search results, that’s still 12.48 click-throughs to your website each month. If only 5 percent of those become clients, that’s a new client approximately every other month from your Google+ Local listing. If we use the same new client averages as our last example, that still works out to $2,400 in new business every other month, or $14,400 per year! Better still, outside of a couple of hours of effort, it won’t cost you a thing to create and optimize your practice’s Google+ Local listing. And, best of all, we’ve created a step-by-step guide, The Therapist’s Guide to Getting More Clients with Google+ Pages, that will walk you through the entire process and it’s available to all members of the Therapy Marketing Institute. I hope this helps answer not only the questions I received a couple of weeks back about how many people click Google+ Local listings in the search results vs. the rest of the organic listings and the paid ads but also impresses upon you the value of creating a Google+ Local listing for your practice! Let us know how well your practice’s Google+ Local listing is doing for you, as well as any questions you have, by leaving a comment below.